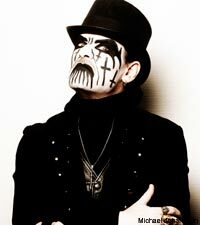 Noisecreep is pleased to report that King Diamond is expected to make a full recovery from open heart surgery. The King underwent triple bypass open heart surgery, which was deemed a success by his doctors. King's wife Livia posted the following news on the King's website, detailing his operation (and the painful process of being catheterized) and how it affects King's music at the present time. The most important thing is that King regains his strength and fully recovers. That means that his music is being relegated to the back burner for now. But understand: He is not quitting. He is not retiring. He is not hanging up the corpse paint. He is just taking a minute to concentrate on his health. Noisecreep sends our best wishes to King as he looks after his health and returns to form. Warning: Livia goes into some deep detail on her husband's procedure. If you have a weak stomach, stop right now and don't go any further. But if you are interested in the nitty-gritty of medical information, then keep reading after the jump. "Let me catch you all up on the past couple of weeks' happenings, because it affects many things. On Monday, the 29th of November, King had to be transported to the nearby hospital by ambulance. After several different tests were done and the EKG machine showing abnormalities, the doctors recommended that he get a cardiac catheterization. Cardiac catheterization is a procedure where the doctors lead a very thin tube up from the leg and into the heart, where it injects dye into the bloodstream. Then a camera at the end of the tube takes many pictures of the heart's arteries, looking for blockages. After this was done, they determined that King had several heart attacks, and three of his heart's arteries were the cause: one was completely blocked, the second was 90% blocked, and the third was 65% blocked. The only solution to this was an open heart triple bypass surgery. If you are interested in the details of how this surgery is performed, please look it up online. I will only touch on the basics. The sternum (breastbone) is cut in half and pulled apart, to expose the heart. Veins are harvested from other places of the body, in King's case it was his left leg and chest wall. The person is then hooked up to a machine that practically does the job of the heart, circulating and oxygenating the blood. The heart is then stopped, and the lungs collapse (the lungs stop working since the blood is being oxygenated by the machine). The surgeon then sews the harvested veins in place, bypassing the found blockages. Once the surgery is done, the surgeon moves the ribs and breastbone back into place and wires it together. The chest is closed as well. They use an electric pulse to start the heart and a breathing machine is lead into the lungs to restart breathing. King's surgery took approximately 7 hours. Everything went well, and King was taken to ICU for recovery. He was walking and eating solid food already, two days after the operation, and he was the first one in the history of the hospital who walked on his own power from the ICU to normal care. Ten days after the ambulance took him to the emergency room, he is at home and is recovering well. It will be a few months before he feels completely normal and is without pain. He would like to mention here that he's eternally grateful for the wonderful staff at Centennial Medical Center who took care of him. Dr. Kourlis, Dr. Kamili, Dr. Alang, Nurse Christie and Nurse Thomas among many others made sure that he got the best care and attention he could ever have hoped for. They were always very nice to me too, letting me stay overnight in the ICU after visiting hours were over. In light of this, he will be taking a break from music and the music business altogether until further notice. He very much wants to write new music, finish the DVDs, and go on tour, but for now, all those things are in the distant future and he's not thinking about them. Please understand that the King Diamond band is not stopping, disbanding or anything of the sort. King's health is first priority, and when everything is going good with him, the music will resume.